Boost the engagement and rigor of your test prep with this jeopardy review game! 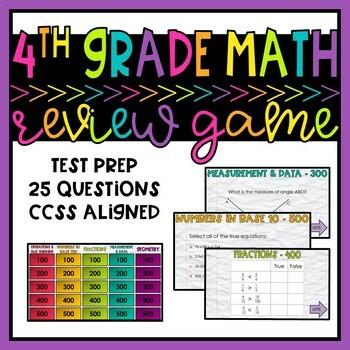 Students will compete to see who knows their 4th Grade CCSS Math Standards the best. There are 25 questions that are aligned to a variety of 4th grade math skills. There are 5 questions for each section of the 4th grade CCSS. Most of the questions are editable, so you can customize this to fit your needs. I have included a recording sheet so you can hold students accountable for every question. I love using jeopardy games for review and it works great for sub plans, too! Just encourage your sub to award bonus points for voice level, participation, and great behavior.